Formby Hall will provide you with the perfect wedding venue thanks to our unique marriage of idyllic rural location, ease of accessibility, luxury accommodation, wedding event expertise and, of course, our reputation for superb cuisine. Later, the dance floor, with its own bar, creates a generously sized area for a sophisticated evening reception. On a warm summer’s night, guests can spread out to the balcony for romantic views across to the lake and fountain. 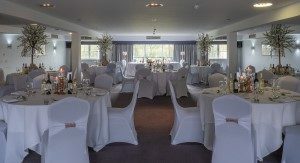 Ranging from the use of our stylishly dressed function suites, to an intimate fine dining experience in The Fairway Grill Restaurant, Formby Hall Golf Resort & Luxury Spa can customize your day in order to make it your own. Our beautiful Ambassador Suite offers stunning backdrops with views over the Old Course that allow you to take your wedding outside during the summer months. With an elegant terrace for Champagne and Canapés, the Ambassador Suite can accommodate up to 250 guests. 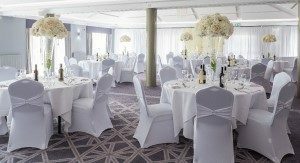 The Suite is however completely flexible, giving you a choice of configuration to set the perfect atmosphere for your special day. Our contemporary Diplomat Suite offers a more intimate option. With its own separate entrance and bar area, the Diplomat Suite also has a patio area overlooking the Old Course. The perfect space for arrival drinks before the celebrations begin.